A remote mountainous region is terrorized by a legendary monster that regularly abducts newlywed brides and kills them. Thakur Jwala Parasad is killed by his bride on his wedding night.Jwala Prasad becomes a monster and starts killing brides dressed in red..Once a groom kills the monster where in Jwala Prasad enters his body and the killing of brides continue for years which has spread terror in village.Everyone in the village seem to be the suspect including Thakur Saab his son Shera,a mad man and the temple priest. 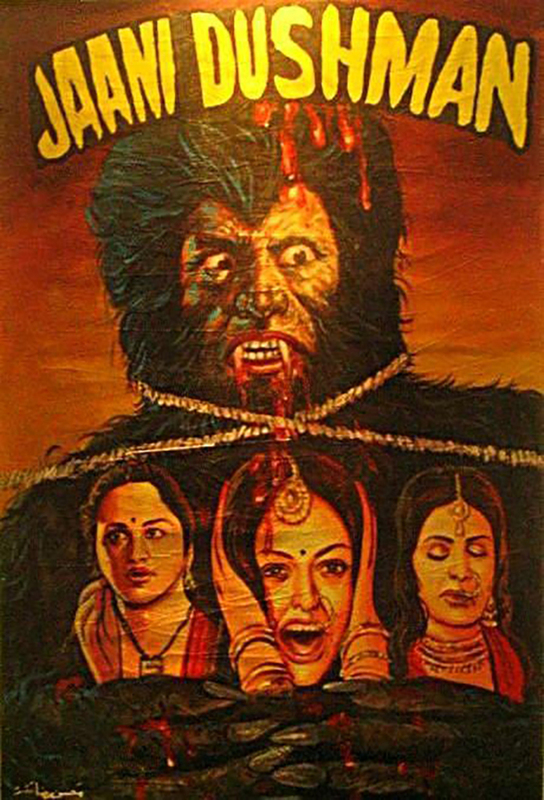 A so-bad-it's-good flick for those who are interested in viewing a real Hindi horror classic. Jaani Dushman is worth watching because: a) It was a defining moment in the careers of the Ramsay Brother, some of the most prolific low budget horror filmmakers the subcontinent's ever seen. b) Though he's uncredited (on the VCD/DVD packaging at least), the monster is played by Amrit Puri, one of the epitomes of the Bollywood villain, best known in India for his role as Mugambo in Mr. India (HAIL MUGAMBO! ), and in the West for his part in Indiana Jones and the Temple of Doom. c) In its own endearingly cheap way, it explores themes of visuality and male violence. Okay, c) may be hard to swallow. Indian villain aficionados will enjoy Amrit Puri at his campy finest, and Western viewers will get a laugh out of the mind-boggling editing and semi-sensical storyline. Purana Mandir is the sequel. Jaani Dushman was a Horrer Suspense movie with huge multi star cast, the negativity of the film is poor special effects as usual in 1970's movies, action stunts were not well composed, In the entire film Sunil Dutt dominated & sidelined Shatu, Reena Roy side lined Rekha, Vinod Mehra turns from mad beggar to CBI Officer his role is not heavy, Prem Nath as Pujari always confused to audience, Plus point of this movie is 3 songs 1. by Mohammed Rafi CHALO RE DOLI UTHAI 2. TERE HAATOON MEIN PEHNAKE CHOODIA 3.Kishore Kumar. Jeetendra dance number & his acting was superb natural Neetu Singh acting was too good, Sanjeev Kumar as usual give power packed performance, Bindy Gu Swami & Sarika wasted, Dialogues between Shatrughan Sinha & Sunil Dutt are good still I remember that KYUN SHERA TAYARI KARKE AYE HO- TAYARI ANARI KARTE HAI KHILADI NAHI, After all it can be watchable movie.